A night of romance, Doo-Wop and festive cheer! Why See A Holiday Doo-Wop? Take a musical trip down memory line and get into the holiday swing of things at the same time with the St. George Theatre annual Holiday Doo-Wop Spectacular! 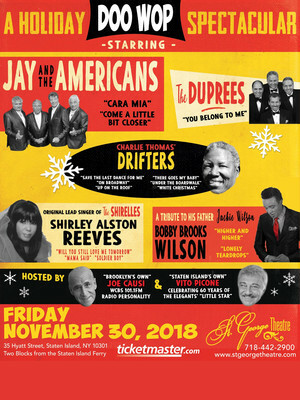 Hosted by Brooklyn's own WCBS 101.FM DJ Joe Causi and the frontman of Staten Island favorites The Elegants Vito Picone, this blue-eyed soul-filled evening is the perfect gift for those seeking to relive the rich vocal harmonies and vintage glamour of the Doo-Wop era of the 50s and 60s. The chockablock concert line-up features a host of Doo-Wop legends including Cara Mia hitmakers Jay and the Americans, Jersey City crooners The Duprees, Vocal Hall of Famers Charlie Thomas and his own Drifters lineup, The Shirelles frontwoman Shirley Alston Reeves and Bobby Brooks Wilson performing a touching tribute set to his father Jackie Wilson. Coif your hair, put on your dancing shoes and get ready for a night of old school romance! Sound good to you? Share this page on social media and let your friends know about A Holiday Doo-Wop at St. George Theatre. Please note: The term St. George Theatre and/or A Holiday Doo-Wop as well as all associated graphics, logos, and/or other trademarks, tradenames or copyrights are the property of the St. George Theatre and/or A Holiday Doo-Wop and are used herein for factual descriptive purposes only. We are in no way associated with or authorized by the St. George Theatre and/or A Holiday Doo-Wop and neither that entity nor any of its affiliates have licensed or endorsed us to sell tickets, goods and or services in conjunction with their events.